North Africa is where Glover and the 36th Division started. They cleaned up after the disastrous Battle of the Kasserine Pass where unseasoned American troops were slaughtered by Gen. Irwin Rommel’s North Afrika Korps. “We landed at Salerno, Italy at 1 a.m. on Sept. 9, 1943. I’ll never forget it. It was the first invasion of Europe by Allied forces,” the 86-year-old former soldier said. “The Germans had the high ground and they were shooting down our throats. We made the landing and it was pretty bad. “I jumped into the water with my full pack and a 97-pound base for a .30-caliber water cooled machine gun on my back . Moments later a German 88 shell hit our landing craft. All but one guy got off the French landing craft and made it to the beach. “We fought our way across the beach and up into the mountains little-by-little. The Germans were shooting right down on us all the time. A few days later we reached Altavilla, a little Italian town just like all the rest of them,” Glover recalled.” That’s where I got wounded the first time. I was hit in the back and shoulder by shrapnel. “I was bleeding quite badly. There were 12 of us who were seriously wounded who were attended to by Italian ladies. They wrapped me in a cold, wet sheet they put in the well. The idea was the cold sheet would help stop the bleeding. They covered us with straw so the Germans wouldn’t know we were there. We spent the next five or six days hiding out under the straw,” he said. “Finally our regimental medics got through some how and doctored us up. They got us on litters and dragged us on down over the mountains and put us on a hospital ship. While we were aboard ship German fighter planes strafed the ship,” Glover said. “I ended up in a hospital in North Africa. I don’t recall where or how long I was there,” he said. “Eventually I got back to my outfit: Company B, 2nd Battalion, 42nd Regiment of the 36th Infantry Division. It was an Oklahoma National Guard unit that served in WW I and WW II. “When I returned to a foxhole we were still in those godforsaken mountains of Northern Italy around Monte Casino. It was about the time Mount Vesuvius was erupting. We watched a bunch of B-25, light bombers, bomb Vesuvius. “It was up there in the mountains I got frozen feet. Both feet were black. Army doctors were almost ready to amputate both of them. Then penicillin came along and they tried that on us and my feet started healing up,” Glover said. 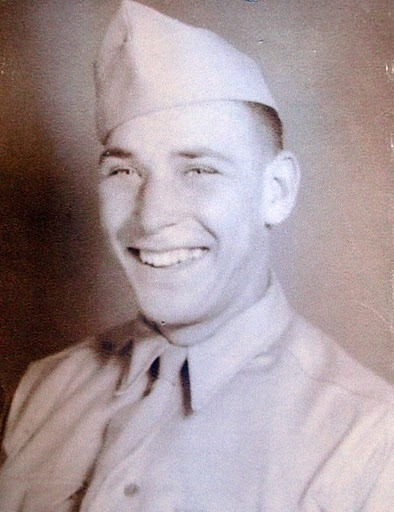 Glover is pictured when he graduated from boot camp at 18 at Fort McClellan, Ala. in 1943. “I found myself in another foxhole with my unit again. By this time our outfit was about to move again I made the Anzio invasion in Italy. It was terrible. It was at Anzio the Germans shelled a hospital and killed a bunch of patients and nurses. “We spent a long time on the beach before we got very far. 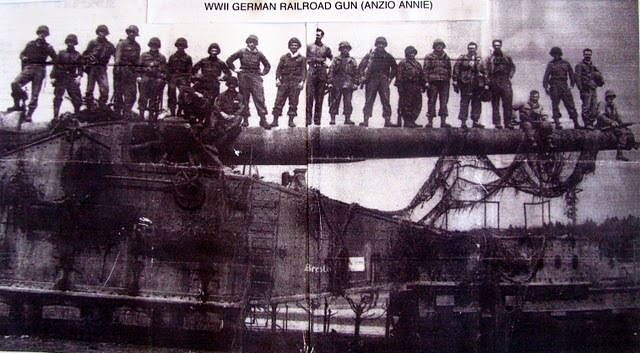 The Germans had this big railroad gun we call ‘Anzio Annie.’ They always said if you could hear the shell from ‘Anzio Annie’ going over you were safe. They would pull the giant gun out of a tunnel to fire it and then run it back in the tunnel to protect it from Allied bombers,” he said. “Part of our 36 Division got surrounded by the Germans at Anzio. The 442nd Regiment, a Japanese unit attached to us, rescued them. I think the 100th Battalion of the 442nd Regiment lost more men trying to rescue our battalion than they had in our surrounded unit. “Southern France and Alcise-Lorraine, down by the Riviera, was our next invasion. It was more of the same, more Germans to fight,” Glover explained. “We pushed the Germans back into Germany. “At the end of the war the 36th Division had just crossed the Rhine River and was moving further into Germany. We made three attempts to cross the Rhine in rubber rafts,” he said. “Our division commander, Gen. Fred Walker, refused to send us across and was relieved of duty. “The Germans had beat the living hell out of us trying to cross the Rhine in rubber rafts. Once you shoot up a rubber raft they don’t float very well,” Glover said. “Our new commander got additional troops and we finally crossed the Rhine. “By this time thousands of German soldiers were surrendering, trying to get away from the Russians. We’d send those Germans on down the road and told them to find another American unit to surrender to. “Even after the surrender there were some ‘Hitler Boys’ who wouldn’t give up. So parts of the 36th Division was sent on mechanized patrol up into the Alps around Hitler’s ‘Eagle’s Nest’ to find them. They were tough, but we captured or killed ’em. “At the end of the war they came up with a deal to send guys home who had at least 85 points. By then I had something like 132 points. I was one of the first to be sent home,” he said. “I ended up at Camp Lucky Strike at Le Harve , France and took a boat to South Hampton, England and from there boarded the Queen Mary and arrived in New York Harbor five days later. After being discharged from the Army, Grover went to work for a trucking company in New York State where he remained for 50 years. He and his wife, Corinne, were married for 61 years until her death in 2006. He has two sons: Robert and Donald who live up north. He moved to La Casa in North Port in 2008. This story was first published in the Charlotte Sun newspaper, Port Charlotte, Florida on Monday, Feb. 28, 2011 and is republished with permission. Click here to view Glover’s collection in the Library of Congress. Dansville- Harold Ross Glover, of Van Campen Street in Dansville, NY, and North Port, FL., died at age 91 on February 26, 2016 at the Venice Regional Hospital, Venice, FL. Ross was born December 2, 1924, at home in Canaseraga, NY to Albert Ross and Daphne Gelser Glover. He was the fourth generation of Glovers to reside in the Town of Burns, with his great grandfather William Glover arriving there from Hull, England in 1851. On December 31, 1945, he was married at the home of Rev. Robert McKee in Dansville to Corinne Burger, the daughter of Carl and Adelia Bentley Burger of South Dansville. At their 60th Wedding Anniversary party in Dansville on December 26, 2005, Mr. Glover noted that his wife wrote him a letter every day for two years while he served overseas during World War II. Corinne died on September 11, 2006. On April 2, 2011, he was married to Alice Eckman at the Trinity Methodist Church in North Port. She is the daughter of Uno and Aili Anas Eckman of East Greenbush. They migrated from Finland. Predeceasing Ross in addition to his wife Corinne and his parents, were his brother Ronald, and his sisters Onnolee Paine, Dorothy Baker, Leola Chasey, and Audrey McColl. 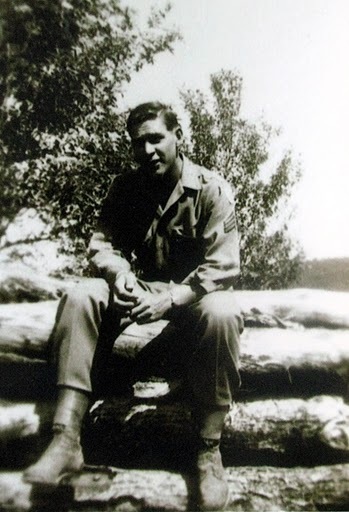 Ross grew up in Canaseraga and graduated from Canaseraga Central School in 2007—-64 years after his class, as he left school to join the Army during WWII. He graduated with the Class of 2007 through the “Operation Recognition” program. 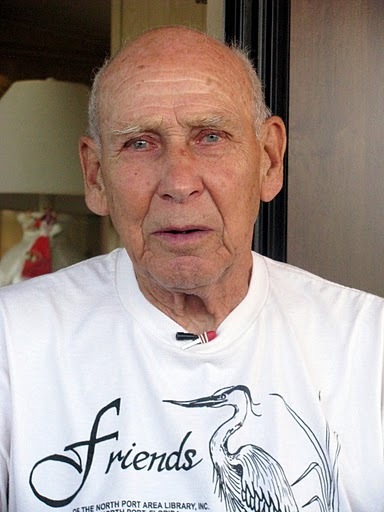 Ross was drafted into the Army in October 1943 and was honorably discharged in October 1945. He served during WWII for two years, most of it on the front lines. He has three Purple Hearts and a Bronze Star. Ross made two beach invasions from North Africa onto Italy (they were Salerno and Anzio—which were the first European invasions and preceded Normandy). He crossed the Rhine into enemy fire into France and made it all the way to Hitler’s bunker outside of Berlin. He was a member of the Fighting 36th Infantry Division, a unit that set the record for the most consecutive days on the front lines—133 days of combat no matter the weather or terrain. On his first beach invasion his boat was shot out from under him and he was thrown into the water with a 100-pound machine gun strapped to his back. He couldn’t swim. But he found a way. He was shot up and hospitalized three times—once caught behind the enemy lines, bleeding in a ditch with the Germans just a few yards away, he survived because Italian women hid him under straw during the day and wrapped wet blankets over his wounds at night until he was rescued. One winter he got frostbite in both feet so bad that they were ready to amputate them. He was saved when an experimental drug reached the front lines: penicillin. Then, and each time he was wounded, he was patched up and returned to the front. There was no stopping the 136th Infantry and Sergeant Glover in the fight for freedom. After the war he worked various jobs, including as a bus driver for the Dansville schools. He got training as a front-end alignment specialist and was considered one of the best for miles around. He worked for many years for Shay’s Service/Main Tire Exchange in Dansville up until his retirement. Surviving in addition to his wife of five years, are two sons; Robert and his wife Shelly of Sleepy Hollow and Canisteo, Donald Glover and his fiancée Donna Fischer of Orchard Park. Five grandsons, Mark Glover of Corning, Matt Glover of Macedon, Dan Glover of Buffalo, Michael Glover of Buffalo, and Chris Glover of New York City. A sister Georgianna (Harry) Scheithauer of North Port, FL. Three step-sons: Mark Veltman of Schenectady, Scott Veltman of Albany, and Brett Veltman of Colorado Springs. Five step-daughters: Ingrid Bruck of Pequa, PA, Dana Testo of Ballston Spa, Leslie Keithline of Larkspur, Co, Lynn-Erin Chesser of Sherwood Park, and Cory Veltman of Sebastopol, CA. Friends will be received on Sunday from 1-4 pm at the Hindle Funeral Home, 271 Main Street, Dansville. A funeral service will be held Monday at 11:00 AM in the Dansville United Methodist Church, 5 Chestnut Avenue, with the Rev. Manilla Owen officiating. Interment will be in the Rogersville Forest Lawn Cemetery, South Dansville, where five generations of the Burgers are interned. Contributions may be made to a memorial for Ross Glover at the American Legion, and for the renovation of the Post where he was a member for seventy years. He held many positions with the Legion at the Post, county, regional and state level, including Commander of the Post. He was instrumental with the American Legion Baseball program, Boy’s State, the White Sabers Drum and Bugle Corps and more. Checks can be sent to Daniel Goho Post 87 of The American Legion, PO Box 306, Dansville, New York 14437. Note that the contribution is in honor of H. Ross Glover.